"Lawyers can be pests and often are." 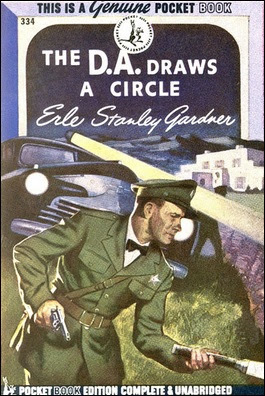 Erle Stanley Gardner was a prolific and consistent mystery writers, who churned out books and short stories faster than a Gatling machine gun can spit out bullets, which included over eighty (!) novels about his most famous creation, Perry Mason – a courtroom wizard who often took gross liberties with the law. However, Mason was not the only the character Gardner created. Gardner penned three, novel-length mystery series with a relatively long and not entirely unsuccessful run. One of these series was published under a pseudonym, namely "A.A. Fair," which covered thirty books about the Nero Wolfean Bertha Cool and her legman, Donald Lam. A third series counted only nine titles and were originally serialized in slick magazines, such as The Country Gentleman and The Saturday Evening Post, before they were published as books. And this particular series has long held my interest as they seemed to offer a delicious slice of small town Americana. The series in question is set in the fictional county of Madison City, California, which had been under the control of a political organization for fifteen years, but the then district attorney got careless and "the sheriff was crooked" - giving rise to a populist uprising against the political establishment of Madison City. Doug Selby and Rex Brandon "furnished the spearhead of a political ticket" that "swept the machine aside." So Selby was sworn in as the new district attorney of the county and Brandon became the newly elected sheriff, but both men still have to content with the remnants of the old political structure. A structure that stills seems to work as a opposition power in the third book of the series. There is, however, another problem slinking into Selby's district. The D.A. Draws a Circle (1939) introduces a dangerous and cunning antagonist for the district attorney, Alphonse Baker Carr, who is a well-known, unscrupulous criminal lawyer with notorious underworld figures as clients – which does not sit well with his new neighbors of the swanky neighborhood of Orange Heights. Mrs. Rita Artrim believes Carr has nothing to contribute to the community that's "either desirable or healthy," but Selby can't stop the lawyer from buying property in the county. Nevertheless, the moment "old A.B.C." sets foot in his district the problems begin for the newly elected D.A. and sheriff: a bail-jumper from Los Angeles, Peter C. Ribber, is picked up by a patrol car and accidentally released again. A dry cleaner finds a brown suit in his truck, on which a "sinister red stain had encrusted into stiffness," with a powder-burned hole in the center. A resident of Orange Heights called the police to report a naked man, who was seen running around, which is followed by the report of a gunshot. On the following morning, the body of a naked man is discovered with a fatal gunshot wound. However, the single gunshot wound has two bullets in them and "the second bullet almost paralleled the course of the first bullet." So the question is not only who fired the fatal shot, but also why anyone would toss a slug into a dead body. The victim is identified as Morton Taleman, a criminal associate of Ribber, who is a client of A.B. Carr. As to be expected, Ribber immediately engages Carr upon his arrest, but Selby and Brandon have another problem on their plate. One of the previously mentioned characters, Mrs. Altrim, became a widow when she lost her husband in a roadside accident, which left her elderly father-in-law a cripple with amnesia. However, Selby learns from their live-in nurse, Miss Anne Saxe, that employer and patient may have designs on one another, because she believes Mrs. Altrim had a hand in the accident – which tosses a double-edged motive for murder into the household. On the one hand, you have to old man who is slowly regaining his memory, as well as his mobility, while on the other you have someone afraid of being found out. This problems comes to a head when one of them goes missing and only leaves a blood-covered liquor closet behind. And this is also the plot-thread that gives the book its title, because Selby, based on the mileage on a speedometer, draws a circle on a map of the vicinity in which the body must have been hidden. On the last pages, the book-title gets an additional and delightful meaning. So, that makes for a pretty bundle of trouble, but The D.A. Draws a Circle is not really about who did what and why, but how Selby navigates a treacherous maze of petty power politics and deceit. You can label the book as a strategic detective and the approach recalls that of an inverted mystery (e.g. Columbo), in which the primary question is how the detective will checkmate his opponents and in this instance it's a two-on-one match. The (interlocking) solutions to the aforementioned problems are merely the cherry on top. I mentioned earlier how the political landscape of Madison City contains remnants of the previous regime, which are actively working against Selby and Brandon. 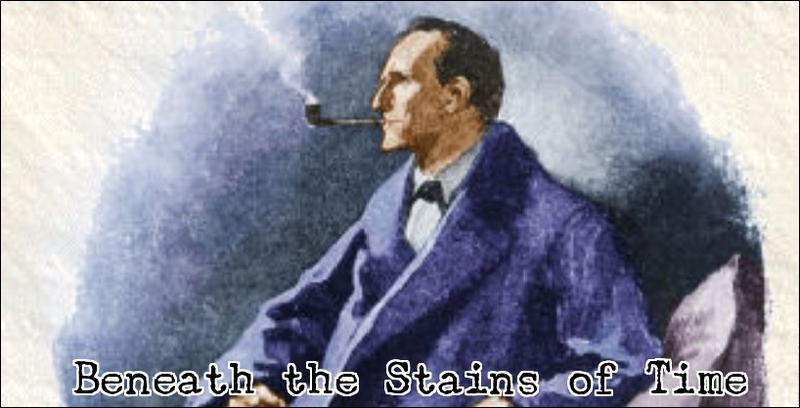 You get a front-row seat to their scheming in the sixth chapter when the editor of the Blade, Frank Grierson, has a closed-door meeting with the dull-witted Chief of Police, Otto Larking. Grierson cooks up a plan ensuring Selby loses both face and political capital, which is done by making sure the man arrested by Larking is exonerated by Carr in court. Before the trail, the Blade is going to publish editorials minimizing the difficulties of the case and suggesting to the public that getting a conviction is a mere formality. So that would make Selby look very bad, if he fails to secure a conviction, while the Blade and Larking come out of it smelling like a rose garden. There are only two routes that could upset this plan: beat the famous criminal lawyer in court or find a complete solution to the problems, which are both easier said than done. In my (far from humble) opinion, the way in which Selby outwitted his reluctant prisoner and "a big-time, crooked shyster," simultaneously circumventing the schemes of his political opposition, is what made The D.A. Draws a Circle a tremendous read reminiscent of the best inverted detectives with a cleverly worked out, double-pronged (murder) plot on top of that. My "book collection" would best be characterized as a "mess". the Doug Selby, the D.A. novels (and they weren't easy to find, believe me). That they've been out of print for most of my lifetime hasn't helped any. Circa 1969, NBC, 20th Century Fox Television, and Paisano Productions (Erle Stanley Gardner's TV company) made a deal to turn the Selby stories into a weekly series. The pilot film, based on The D.A. 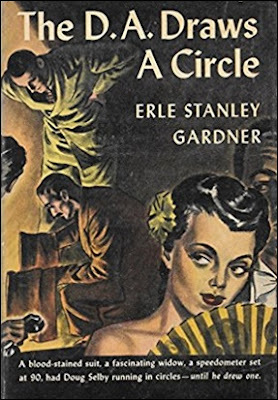 Draws A Circle, was made in '69, and was the final TV production into which Erle Stanley Gardner had any input; he passed away the following year. At this point, Gardner's health was beginning to falter, so he wasn't able to micromanage as he had with the Perry Mason series in the '50/'60s. His longtime literary agent Cornwell Jackson served as Executive Producer (Uncle Erle's surrogate here). The pilot eventually came to bear the title They Call It Murder when it was finally shown on NBC in 1971. Doug Selby was played by Jim Hutton, six years before he got the part of Ellery Queen. Lloyd Bochner played A.B. Carr - type-casting at its best. Had the Selby series sold, he was guaranteed to steal the show from the low-key Hutton every time. Jo Ann Pflug as Sylvia Martin, the designated female interest. Robert J. Wilke as Sheriff Rex Brandon, Selby's confidant. - Edward Asner, who at that point was still typed as a meanie (official or unofficial); Mary Tyler Moore was still in his future (but would not have been had this series sold). For whatever reasons, They Call It Murder fell into public domain; my copy is a dollar-store DVD, one of many that are available from various companies who specialize in copyright-lapsed films and TV (many of these spotlight Ed Asner as "starring" in this movie, even though he is clearly in support). They Call It Murder can also be seen in its entirety on YouTube, at least the last time I looked (which was just before I logged on here). This was filmed with Jim Hutton (!) and can simply be watched on YT (!!). Well, I really have no excuse not to watch it any time soon then. Thanks for the background information and heads up, Mike! And good look with excavating your book collection. I've read plenty of ES Gardner, but this series I've not encountered. Not that there are that many old mystery paperbacks floating around these days, but if I spot one, I'll certainly pick it up.